Easy money. Infinite possibilities. Who doesn’t (in some capacity) love hot sauce? Some people use it sparingly, some pour it on everything, some are selective, some like mild, some like the burn – your – head off spicey… I love them all. The reason, besides the obvious great spicy flavor, is because good hot sauce is balanced. It’s a common theme running through my posts. Balance is essential for any food, no matter how simple or complex. Hot sauce is a great example. Anyone can produce an incredibly spicy sauce, but to have it balanced is another story. 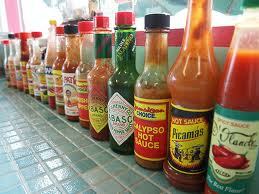 The successful mass-produced hot sauces are successful not only because they’re hot, but also because they taste good. They have a little of everything, and have balance! The best way to achieve this is start with a basic sweet/sour savory platform, without any initial spice. I like to use boiled carrots, apple cider vinegar, onion, garlic, a little paprika, brown sugar, and a little of the carrots’ cooking liquid. The carrots are the ‘secret’ ingredient, if you will. They provide flavor, consistency, and most importantly, act as a catalyst for blending and bringing the flavors together. Once you understand this platform, and the balance it creates, you can think about spice. What kind of peppers do you want to use? Do you want to use a blend of peppers? Do you want to use a few dry peppers? How many peppers? Do you cook the peppers first? Do you want seeds? The answer is yes and no to everything. This is where it becomes your sauce. I am going to give you my ‘basic’ recipe, and hope that you will make it, enjoy it, and run with it. Maybe you want to add a few raisins or dry apricots for additional sweetness and contrast. Maybe you want a little bit of honey or agave instead of brown sugar. Maybe you want it hotter. Maybe you want it thinner or thicker. Again, the possibilities are infinite, and this is just a basic recipe to give you a decent homemade hot sauce, and inspire you to create your own work of art. As a side note, it usually takes about 2 days for the hot sauce to blend properly once it’s produced. You should never use it right away. In a small sauce pot, completely cover the carrots with cold water. Add about 1 tbsp salt and bring to a slow boil. Cook until tender and remove from heat. Add all ingredients to a blender, including the cooked carrots and about 1 tbsp kosher salt. Add 3/4 cups of the carrot cooking liquid and puree. Run the blender on high speed and puree until as smooth as possible. Cool the puree and store tightly. Store in the fridge for 2 days, tightly sealed. Now it’s ready to use. You can leave it at room temp at this point, it won’t spoil.